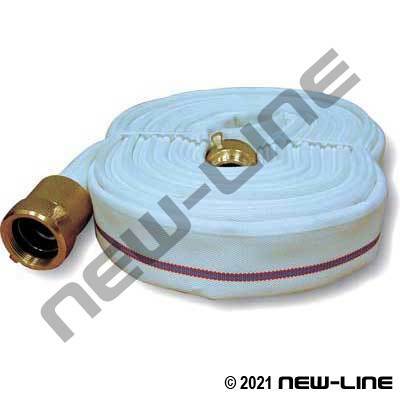 NL9770 is a 'double jacket' textile fire hose that is similar in construction to our standard NL9720 single jacket, but this hose has an extra jacket for added resistance to punctures or external wear. Unlike other double jacket fire hoses on the market our NL9770 has a urethane tube which is 3 to 4 times as puncture resistant than traditional rubber tube hoses and is up to 50% lighter in weight. These features are ideal for applications in wet & rugged environments where punctures are prevalent and the hose can be weighted down by wetness. NL9770 provides an alternative to more expensive rubber washdown hoses but will not withstand as much abuse or dragging as more expensive alternatives such as our NL2005 Oroflex or NL9780 Gold Crown. Its cover is resistant to mildew, rot, weathering, and limited abrasion (not resistant to sharp objects). Popular assemblies are listed below; any nonstick assemblies can be made up from our bulk inventory. For cut lengths see NL2420 or NL2005 Water Discharge. Typical Fittings: N9701/9702 hardcoat aluminum or brass expansion couplings, N9721 instantaneous forestry expansion ends (1.81" bowl). N300 series specialty fittings (see fittings section for specific threads). Construction: Tube: Clear/Green Urethane. Jacket: White, double jacket, circular woven, all virgin spun polyester.